2016-17 (Freshman): Competed in 18 of WCU's 32 games on the season while making one start ... Made collegiate debut in the season opener at Miami (11/11) ... Scored career-high nine points in nine minutes at Miami (11/11) ... Drained three 3-pointers in the loss at Miami (11/11) ... Made first career start at VMI (01/12) ... Scored six points at Mercer (01/30) on a pair of 3-pointers in the final two minutes of the game ... Collected seven rebounds including a season-high of two versus Hiwassee (11/13) and at Marshall (11/19) ... Dished out three assists throughout the year ... Had two steals against Hiwassee (11/13). Prior to Western Carolina: Spent the final three years of his prep career at Cherokee High School where he was a three-sport athlete ... Completed his prep career with 1,064 points as he averaged 14.8 points per game over just three seasons at Cherokee ... Spent freshman year at Choctaw Central High School in Choctaw, Miss. ... As a senior was named to the North Carolina Basketball Coaches Association All-District Second Team ... Named the Most Valuable Player at the Coaches versus Cancer Shootout ... Was a two-time all-conference honoree ... Named All-Western North Carolina as a senior ... Earned Honorable Mention All-Conference as a junior ... Was a two-time Honorable Mention All-Western North Carolina ... Earned all-conference accolades in both football and baseball throughout his three-year career ... Led Cherokee to the 2013-14 and 2015-16 Big Smoky Mountain Conference Championships ... The team also advanced to the second round of the State Championships his sophomore season, the third round his junior year and eventually the fourth round as a senior. For the ninth game of the season, the Cats return to the friendly confines of E.J. Whitmire Stadium to host the Bulldogs of The Citadel for Homecoming 2018. Western faces the Bulldogs for the forty-third time since 1972. The Series: Western trails The Citadel 17-24-1 overall in the series. After winning on the road in Charleston last season, the Cats broke a two-game skid to the Bulldogs. Coach Speir is currently 2-4 against vs. the Citadel. Games played by the Bulldogs this season prior to the WCU contest: (8 games) The Bulldogs kicked off the season with an opening conference loss at Wofford (21-28), followed by another loss against the Mocs in Charleston (28-29). Week three was a win vs. Mercer in Macon (38-31).followed by an OOC game loss vs. Towson (27-44). A loss to ETSU followed (23-26), then a win over the Keydets of VMI (34-32). The Dogs then lost to Furman (17-28). Last Season's Game vs. The Citadel (Nov. 14, 2017) - Catamount Football Scores Road Win at The Citadel, 31-19 - Senior running back Detrez Newsome broke Saturday's third tie with an 81-yard touchdown romp to cap a one-play scoring drive that gave No. 24 Western Carolina a lead it would never relinquish as the Catamounts scored a 31-19 Southern Conference road victory over The Citadel Bulldogs in Southern Conference action at Johnson Hagood Stadium. Redshirt sophomore QB Tyrie Adams threw for three touchdowns - two to redshirt senior WR Terryon Robinson - and Newsome rushed for 197 yards as the Catamounts picked up their seventh victory of the season - fifth in league play. The 2-5 Bulldogs will be looking to solve some of the offensive woes against the perceived weak defensive unit of the Catamounts, they play to play "keep away" from the high scoring offensive unit of the Cats. Currently, the Bulldgs are 5th in scoring offense in the SoCon, scoring an average of 26.9 ppg (WCU is 3d at 34.2 ppg), the Bulldog defense is also in 5th place holding opponents at 31.1 ppg (the Cats are 8th at 40.8 ppg). The Citadel is in second place in rushing offense, averaging 264.4 yards per game (WCU is 3d at 224 ypg), and the dogs are in 4th place in rushing defense, holding teams to 155 ypg (Cats are in 7th at 192.2 ypg). In pass offense, the dogs come in 9th place at 103.3 yards gained per game (Cats are 4th at 262.5 ypg) while the dogs are in 5th place in pass defense giving up 250 yards per game (the Cats are in last place in pass defense, giving up 296.9 ypg). According to Massey, Western Carolina should be 3-6 after this game. I'm going to disagree, the Cats are 4-5 after this game. Prior to Western Carolina: Played prep basketball at Christ School in Arden, N.C. ... As a senior, selected to the All-NCISAA 3A team ... Named Carolina Athletic Association Player of the Year ... Earned All-Carolina Athletic Association honors ... Connected on over 100 3-pointers for the second-straight year ... Set the career Christ School 3-point mark with 285 made triples ... Finished with 1,235 career points to rank fourth in the Christ School record books ... As a junior, averaged 16.1 points, three rebounds and three assists per game and was named All-Carolina Athletic Association, as well as earning an Ingles' Player of the Week honor ... His team finished with a 23-8 record and won both the regular season and tournament conference championships before advancing to the NCISAA 3A quarterfinals ... Made 111 3-pointers during the year to set a new Christ School single-season record ...As a sophomore, was named all-conference and helped lead the team to a regular and conference tournament championship while advancing to the semifinals of the NCISAA 3A championships ... Played his first season as a prep at Dobyns-Bennett High School in Kingsport, Tenn., where he earned first team all-conference underclassmen while helping the team win a conference and district championship. Prior to Western Carolina: Was a four-time All-Smoky Mountain Conference selection including an honorable mention as a freshman ... Was honored by the Asheville Citizen-Times three times with All-Western North Carolina team selections ... Was a two-time- first-team All-District honoree and twice named the Hayesville High School Male Athlete of the Year ... Supplanted his older brother, Zach, as the all-time leading scorer in Hayesville High history with 1,958 career points ... Averaged 27.6 points, 7.2 rebounds, 3.6 assists, and 3.0 steals per game as a senior ... Scored a school-record 704 points as a junior while also setting the single-game record with 46 points ... Over the season, averaged 28.1 points, 7.4 rebounds, 4.4 assists and 3.0 steals per game for Hayesville ... As a sophomore scored 17.9 points per contest while helping lead the Yellow Jackets to a Smoky Mountain Conference title and a 23-5 record. Personal: Is the son of Jenny and Michael Cottrell ... His father, Michael, played collegiate basketball at Lenoir-Rhyne after scoring over 2,500 career points as a prep ... His older brother, Zach, played men's basketball at Appalachian State. ... Grandfather, Steve Cottrell (145-133), coached at Western Carolina for 10 seasons from 1977-87, earning Southern Conference Coach of the Year plaudits in 1979-80 ... Uncle Todd Cottrell played football at Western Carolina while his aunt Laura played basketball at Clemson. Prior to Western Carolina: Earned both Eastern Cincinnati Conference (ECC) Athlete of the Year as well as second-team all-district plaudits as a senior ... A four-year varsity player, he led the ECC in scoring with an 18.1 point per game average on 54.4-percent shooting from the floor that included 46.6-percent shooting from beyond the arc ... Added 4.2 rebounds and two assists per game ... As a junior, averaged just under 10 points per game at 9.5 points per game to rank third on his high school team ... Shot 50.8-percent from the floor while averaging 2.2 rebounds per game as a junior ... Listed as the fifth-rated shooting guard in the state of Ohio in 2018. Every trophy needs a name, what do you think about...... "The Rock" for this one? For the eighth game of the season, the Cats travel to Johnson City to face the #25 nationally ranked Bucs of East Tennessee State University for the first time in the new William B. Greene, Jr. Stadium. This game is now known as the annual Blue Ridge Border Battle. Two seasons ago, Western and the Bucs revived the series that started back in 1932, but abruptly ended in 2003 when the Bucs eliminated college football. Adding to the newfound rivalry between the two mountain teams, the Bucs upset the Cats at the Bristol Motor Speedway in 2016 in their first season back in the SoCon. The Series: This series stretches back to 1932, with the Cats holding a slim 24-22-1 lead over ETSU. Games played by the Bucs this season prior to the WCU contest: (8 games, the Bucs are 6-2 overall) ETSU kicked off their season at home against DII, Mars Hill with a 28-7 win. ETSU then travel to Knoxville to play the Volunteers a week later, losing 59-3. In week three of the season, the Bucs remained on the road as they travel to Lexington, VA to meet the Keydets, picking up a close road win, 27-24. Returning home to host the Paladins.the Bucs picked up an even closer win, 29-27. The Mocs then visited Johnson City and ETSU picked up their third conference win 17-13. Big South foe Gardner-Webb then visited the Bucs for game six, and the Bucs rolled to a 45-0 victory. ETSU then went on the road for two games prior to Western's visit, traveling to the Citadel and winning 26-23, ETSU then visited Wofford, where they picked up their first conference loss, 17-30. New head coach Randy Sanders returns a wealth of experience as the Bucs look to improve on a 4-7 record from last season. The Buck lost only 4 starters from the 2017 team. Sanders hired former Bucs wide receiver Marcus Satterfield as his offensive coordinator/quarterbacks coach, Steve Brown his defensive backs coach and Matt McCutchan to oversee the offensive line. Sanders retained Billy Taylor (Defensive Coordinator/Inside Linebackers), Mike Rader (Wide Receivers/Recruiting Coordinator), Gary Downs (Running Backs), Daryl Daye (Defensive Line/Special Teams), Dylan Lewellyn (Outside Linebackers) and Al Johnson (Strength and Conditioning) from the previous staff. The Bucs are tied for 8th place in scoring offense, putting up 24 points per game (WCU is 3d at 33 ppg), ETSU is third in scoring defense, holding opponents to an average of 23 points per game (WCU is 8th at 40 ppg). ETSU comes in at 7th place in rushing offense, averaging 130 ypg (WCU is 3d at 218 ypg) and ETSU comes in 2d place in rushing defense, holding opponents to 115.2 ypg (WCU is 6th at 184.4 ypg). In passing offense, the Bucs are in 6th place at 197.6 ypg (WCU is 3d at 267 ypg) and the Bucs are in 3d place in the pass defense, holding opponents to 197.6 ypg (WCU is 8th at 297.3 ypg). Game prediction: Per the Massey Ratings, the Cats have a 27% probability of winning (28-35) over the Bears. According to Massey, Western Carolina should be 3-5 after this game. I'm going to disagree, the Cats are 4-4 after this game. Prior to Western Carolina: Began his prep career at Neuse Christian before transferring to Hargrave Military Academy for his junior and senior seasons ... Originally committed to Longwood out of high school ... a versatile wing that averaged double-figure scoring over his prep career, improving his average from 14.5 points as a freshman to 16.5 as a sophomore ... He also averaged over 4.0 rebounds per game including six as a freshman ... Named the Virginia Independent Conference (VIC) Player of the Year as a junior, averaging 19.6 points, 6.7 rebounds, and 2.3 steals per game ... Earned first team all-state on a Hargrave team that set a school-record with 26 wins and earned a spot on the prestigious postgraduate team for his senior year. Brigham Waginger was named an assistant coach on Larry Hunter's staff on July 1, 2011. Waginger spent the 2010-11 season as the Director of Basketball Operations. Following the 2014-15 season, Waginger was promoted to recruiting coordinator for the Western Carolina men's basketball program. In April of 2015, Waginger was named to the Under Armour “30-under-30” team as selected and released by the National Association of Basketball Coaches (NABC), it was announced during the organization’s annual convention held in conjunction with the 2016 NCAA Men’s Final Four. The “30-under-30” team is designed to highlight and recognize up-and-coming basketball coaches across the nation. Through five seasons on the sidelines, Waginger has proved to be a valuable asset to the program in both player development and in game planning, especially in the areas of scouting. With Waginger on the sideline under Hunter’s tutelage, WCU has won 81 games, advancing to two Southern Conference tournament championship games. Last season, the Catamounts earned a post-season berth for just the third-time in program history, accepting a bid in the College Basketball Invitational (CBI). As the Director of Basketball Operations, Waginger was primarily responsible for many of the day-to-day operations of the team including travel while also assisting in video exchange. Waginger was a four-year standout for the Western Carolina men's basketball team from 2006-10 playing for current head coach Larry Hunter. Known for his tough, hard-nosed play on the court during his four-year career at WCU, Waginger finished with 810 points including 27 double-digit scoring outings. He shattered the school's career benchmark for steals by 64, finishing with 285 career thefts, well above the previous record of 221 steals held by WCU Hall of Famer, Henry Logan. His 285 career steals rank third in SoCon history. A native of South Webster, Ohio, Waginger finished his WCU career as both the school's career and single-season (90) steals leader with his name occupying three of the top four single-season steals performances. Offensively, Waginger connected on 165 3-pointers to rank sixth on WCU's career 3-pointers made ledger at the time of his graduation. He additionally finished his career ranked ninth in career assists with 398 over his four years in Cullowhee. As a senior, Waginger earned third team All-Southern Conference honors from the voting media and was named the SoCon's co-Defensive Player of the Year after pacing the league in steals for a third-straight season - the first player to ever do so and just the second player to lead the SoCon in steals three-times in a four-year career. He was additionally selected to the 2010 CollegeInsider.com Mid-Major Defensive All-America team as he helped guide WCU to 22 seasonal victories - the most since moving to NCAA Division I - and returned the Catamounts back to post-season play for the first time since 1996. During his junior year in 2008-09, Waginger helped the Catamounts to a share of the SoCon North Division Crown. He scored a career-high 22 points including nailing a career-best seven 3-pointers in the home finale victory over Chattanooga which secured the share of the divisional title. This week's Purple & Gold Player of the Game is junior quarterback Tyrie Adams. Adams amassed a school-record 545 yards of total offense including 360 yards through the air and a career-high 185 yards rushing on Saturday afternoon at Five Star Stadium. Adams accounted for four touchdowns – two rushing and a pair of passing TDs – as the Catamounts piled up 710 yards of total offense, finishing one yard shy of the school record set by the Hall of Fame 1969 football team (711 yards vs. Emory & Henry). The St. Petersburg, Fla., native moved into second-place in WCU’s career record books with 6,347 career passing yards while closing to within one TD pass of former mentor Troy Mitchell (50, 2012-15) for the program’s career passing touchdown record now with 49 career scores through the air. 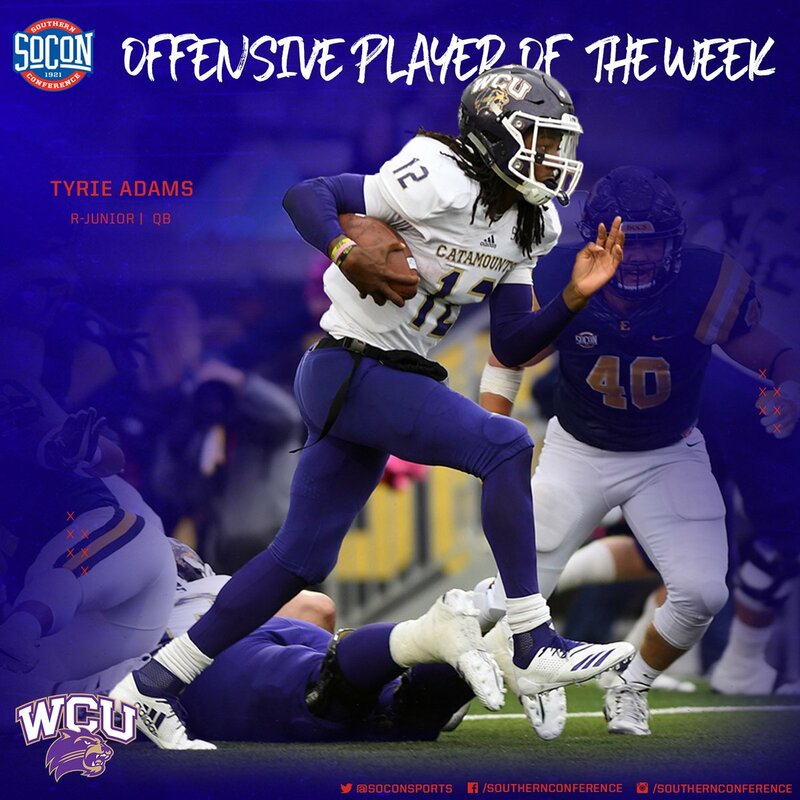 Purple & Gold sends our congratulations to Tyrie Adams on his selection as this week's WCU Player of the Game. Former Elon men's basketball standout Monty Sanders joined head coach Mark Prosser's staff at Western Carolina in mid-April of 2018, accepting an assistant coaching spot after spending a combined eight years on staff at his alma mater in the Piedmont Triad. Sanders brings a wealth of experience to the position including coaching at both the high school and AAU levels. The past eight seasons have been spent at his alma mater, Elon, including three in operations and the last five as an assistant coach under head coach Matt Matheny. "I am beyond excited to have another phenomenal person on staff that also possesses tremendous experience both as a coach as well as a player within the Southern Conference," Prosser said of the addition of Sanders to his coaching staff. "Monty is a great addition to our staff which I feel is very strong, energetic, and ready to get going." A 2009 Elon graduate and former captain of the Phoenix basketball team, Sanders returned to Elon as the Director of Basketball Operations in August of 2010. He was promoted to an assistant coach on the Elon men's basketball staff in the summer of 2013. While on the bench over the past five seasons, Elon recorded double-digit victories each year including a .500-or-better record three times, twice recording 18-win seasons. Sanders proved to be an invaluable recruiter for Elon, helping to successfully draw players from across the United States as well as international talent from Canada, Germany, Croatia, and England. He was instrumental in recruiting Elon's the school's top career 3-point shooter in Tanner Samson, who made 324 career treys and finished with 1,320 career points scored. Working primarily with Elon's big men, Sanders aided in the development of the program's all-time blocked shots leader -- and 1,600-point scorer -- Lucas Troutman. Last season, the Phoenix post players shot nearly 50-percent from the field in 2017-18, while also connecting of 39-percent from beyond the 3-point arc. In addition to his coaching duties, Sanders also served as the program's liaison to both the strength and conditioning staff as well as to the academic advisor. Over eight of the nine semesters he held the latter role, the team carried a collective GPA over 3.0. Sanders helped the Phoenix to 21 wins in the 2012-13 season, the most victories in the NCAA Division I era at Elon, and the program's first D-I postseason berth in the CollegeInsider.com Postseason Tournament. That same squad captured the SoCon North Division regular season championship. Sanders was also a part of Elon making the transition to the Colonial Athletic Association (CAA) in the 2014-15 season. More recently under Sanders' guidance, forward Tyler Seibring earned All-CAA second team honors for the second-consecutive season in 2017-18 while also garnering a spot on the NABC All-District 10 Second Team. Seibring, who reached the 1,000-point plateau, was also rewarded with his work in the classroom with a second-straight Academic All-America selection as well as the CAA's Dean Ehlers Leadership Award that is presented annually to the men's basketball student-athlete who "embodies the highest standards of leadership, integrity and sportsmanship in conjunction with his academic athletic achievement." Elon finished the 2016-17 season fourth in the CAA, which was ranked the 11th-best conference in the nation. The Phoenix cracked the CollegeInsider.com Mid-Major Top-25 Poll on Nov. 23, 2016, holding a spot at No. 23 for consecutive weeks. Seibring became the second player under Matheny to earn Academic All-America honors and was also named to the All-CAA Second Team as well as the CAA Scholar-Athlete of the Year. Prior to returning to Elon to get his start in collegiate coaching, Sanders served as an assistant boys' varsity basketball coach at Cardinal Gibbons High School in Raleigh and the head coach of the Garner Road Basketball Club AAU 15U boys' team. Sanders was a two-year letter winner on the Elon basketball team, serving as a team captain his senior year under head coach Ernie Nestor after transferring from the University of Richmond following the 2005-06 campaign. Among Sanders' top on-court performances came in the 2009 Southern Conference Tournament when he scored a career-high 21 points on 7-of-8 shooting while adding nine rebounds in an upset victory over Wofford in Chattanooga, Tenn., with Prosser on the Terriers' bench. Sanders served as a leader away from the basketball court at Elon, serving on the Student-Athlete Advisory Council from 2007-2009 including a year as the organization's vice president. He was the brainchild behind the annual "Phoenix Field Day" for inner-city youth of Burlington, a program that has continued to be successfully run by Elon student-athletes. Sanders graduated with a Bachelor of Science in Business Administration with a Concentration in Marketing. Sanders and the former Page Hall were married in May 2016. They have a daughter, Emmerson Sloane Sanders, who was born in January 2018.